First light with the new telescope. 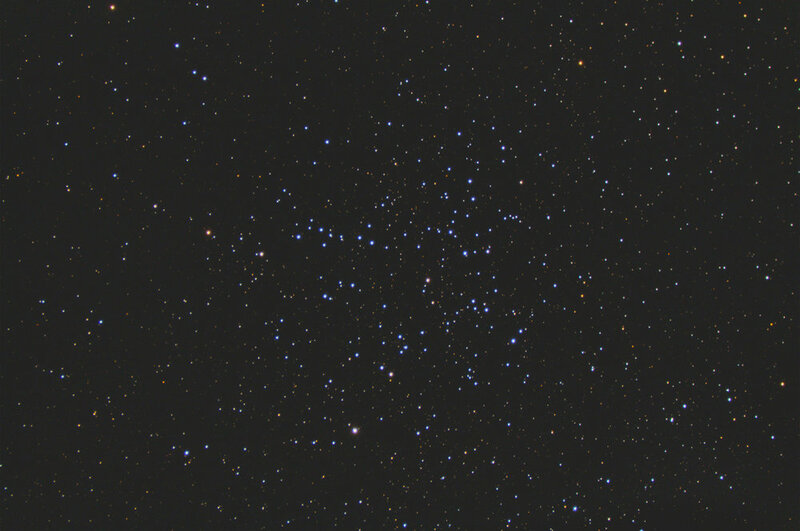 Only managed 30 minutes of imaging time before the clouds rolled in. It’s been a few weeks since I picked up the used EdgeHD 11” SCT. And in that time I made some final hardware decisions for the camera, and other gear. In the end, I got the Moonlite CHL Large format Edge focuser. It’s low profile to take up as little back space as possible. The Edge has a generous 147mm backspace allotment, which is quite a bit, but when your focuser takes up all that space, it doesn’t leave a whole lot of room. Initially I wanted a really large sensor camera with larger pixels around 6-8um size. Those cameras approach the $4k range, then you need 2” filters on top of that which could set you back a few more thousand. It was way too costly, so I went with a color camera instead. It simplifies the image train, and operation of the whole scope. I ended up with a ZWO ASI071MC-Pro camera. It’s an APSC sized sensor with 4.78um pixel size. This means my guiding has to be really good to keep round stars at that pixel scale. 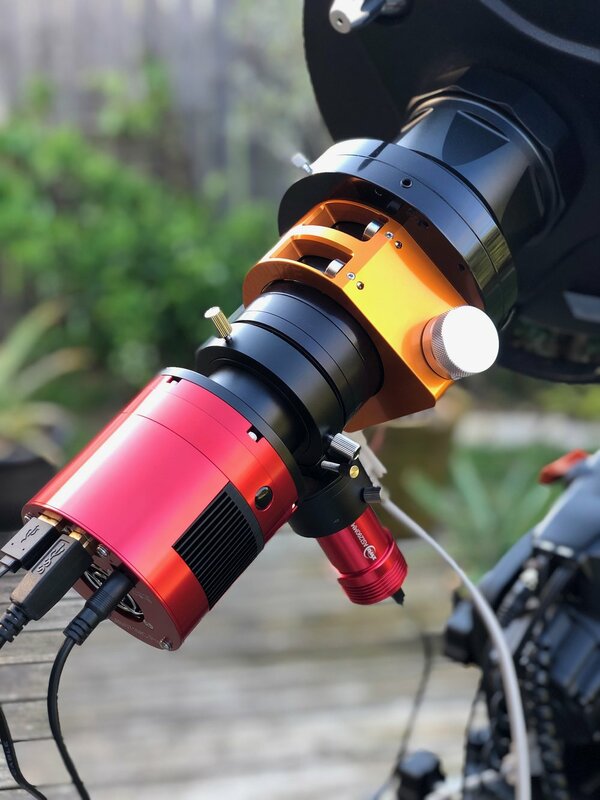 In addition to the camera, I got an Off-Axis Guider (OAG) from ZWO as well, and paired it with the ZWO ASI290MM-Mini guide camera. The very tiny pixels of this camera are ideal for increased guiding resolution. A better option might have been the ZWO ASI174MM-Mini due to its sensitivity which benefits OAG guiding, but didn’t want to spring for a new guide scope. This was the view through the OAG of the star field shown in the image at the top of the post. It can be quite challenging to find a star to guide on when imaging galaxies that don’t have a cluster of stars like M38 above. The CGX performed quite well. Prior to guiding with the OAG, I achieved a total RMS of around 1.2 on my smaller scopes. On the OAG, I’ve had as low as .3 arc seconds of error. That’s super accurate. Last night as the clouds rolled in I only got 30 minutes to image M38, and due to the poor seeing, my guiding RMS was just over 1 arc second. I was able to save the guide log and took a screen shot of it. This is 30 minutes of guiding crunched into the window. You can pretty easily see the periodic error fo the worm gear spiking in the graph. If I train the periodic error correction within the mount, I might be able to eliminate that spike and smooth out the chart some. In all, I think it was pretty successful fun (for 30 minutes). But it was 3 anguishing nights of trial and error before I got everything to mesh. It was a comedy of software errors as a few versions of EKOS came out that had introduced some new bugs. I was not able to get the internal guiding software to work with the OAG. It’s previously worked fine for me with a guide scope. So, I paired up EKOS with PHD2 to get the job done, but only attempted it on the third night out as our skies started to cloud up. At this point, i’m not completely happy with the OAG setup. As you can see in the OAG image, the small diameter which the camera goes through needs to be adjusted so I have more field of view. The prism also sticks into the frame just a hair, so I need to adjust it some as well. The final scope setup all connected together and ready to go. A close up of the imaging train. 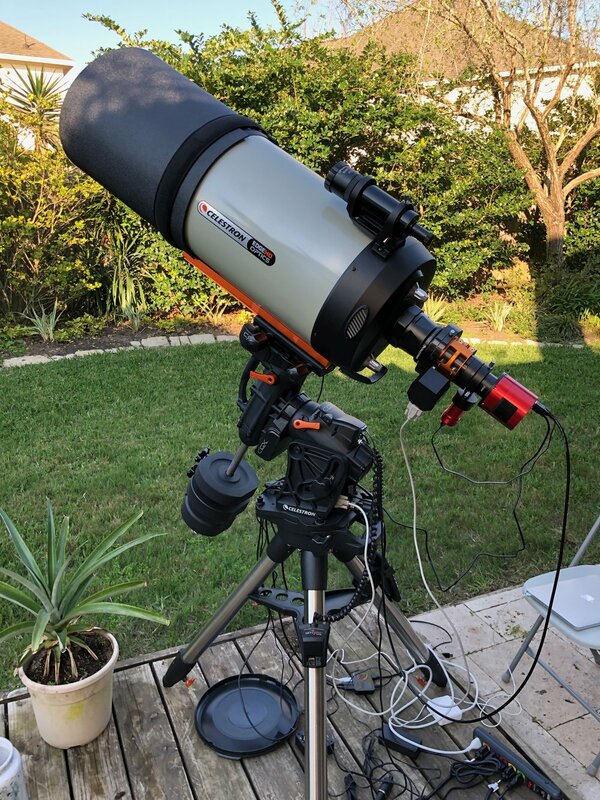 Starting at the EdgeHD 11”, there’s the Celestron .7x Edge reducer, the Moonlite focuser, a spacer ring, an Astronomic L-2 UV/IR cut filter, the OAG with 290mm, another spacer, and then the 071mc color camera.